One of the reasons I had not put Pad Thai  on this site until now is because I knew it would be a lot of work as there is so much that needs to be said about the dish. Pad Thai, like many true street dishes  cannot be adequately explained in one post. It’s a dish that was born out of an interesting era with an interesting history; it’s a dish that may look quick to make but actually requires pretty extensive preparation; it’s a dish that is somewhat picky about the quality of the ingredients that go into it. Unavoidably, this will have to be a series. However, the first installment of our Pad Thai series has nothing to do with its history, ingredients, or method of preparation. I don’t know what kind of logic I’m operating on, but I’ve decided to commence the series with what in my opinion is the ideal Pad Thai pan. To me, it’s that important. Those who have been to Thailand may have noticed that vendors whose specialty is Pad Thai oftentimes sell Hoy Tod  (หอยทอด mussel pancakes/fritters) also, and that these vendors always use a large, flat carbon steel pan which lends itself well to both dishes. There are reasons for this the most important of which is that a well-seasoned, wide, flat-bottomed pan with short sides makes it harder for you to botch your Pad Thai. This is due to the fact that this type of pan has large surface area which allows for better evaporation. And good evaporation means better chances of you getting the much-loved brown bits and “wok smell” both of which are desirable in stir-fried noodles (cf. my post on Pad See-Ew). In the case of Pad Thai, the brown bits and wok smell aren’t very important. Nevertheless, good evaporation is key to creating noodle strands that are well-seasoned and entirely cooked through while retaining a bit of chewiness — exactly some of the characteristics of superior Pad Thai. Add too little sauce and the noodles are under-seasoned and dry; add too much sauce and the noodles are over-seasoned and most likely soggy. To produce a good plate of Pad Thai you still need to practice, of course, but a good, wide, flat-bottomed pan makes it much less likely for you to ruin the dish. The sauce gets absorbed and the excess moisture evaporates before it causes the noodles to become too wet and gummy. A heavy, wide, flat-bottomed paella pan with short rims would work well provided that it’s made of superior material. 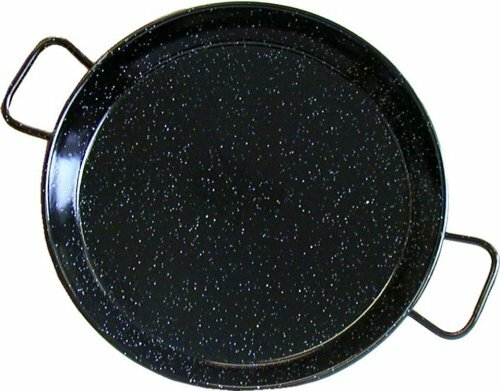 A traditional steel paella pan or an enameled steel paella pan are definitely not a good choice. A friend of mine loves making Pad Thai in his 17-inch aluminum nonstick paella pan and you can’t persuade him otherwise. However, at a risk of stating the obvious, paella is not a stir-fried noodle dish, and most paella pans aren’t made with dishes like Pad Thai in mind. So if you’d like to go the paella pan route, choose wisely. You want it to have large surface area, great heat retention, an ability to withstand high heat, and a nonstick surface. But the best pan for Pad Thai which I have ever come across in my entire life is not a paella pan at all; it’s a cast iron pan. Cast iron cookware is rarely, if ever, used in Thailand (in fact, I have never seen it anywhere, and the ones I’ve seen have been brought over from the US), so you just have to try it to see that even though cast iron pans and Pad Thai seem like an odd pair, they work so well together. One factor that makes a cast iron pan better than any wide and flat pan with short and flared rims is its excellent ability to heat evenly and to retain heat for long periods of time — precisely what a dish like Pad Thai desperately needs. Not any regular paella pans can do this. The pan which I’ve used to make Pad Thai with consistently great results is a pre-seasoned 17-inch cast iron pan made by Lodge. With the bottom measuring 14 inches across and the rims standing 2 1/2 inches tall, it gives you enough surface area to make 3-4 servings of Pad Thai at a time — something that, when done in a smaller pan, inevitably leads to noodles that are soggy or stick together. It distributes heat perfectly and sits nicely on any type of stove top including flat ceramic surface. I’ve recently discovered this pan and fell head over heels in love with it. This pan is great for Pad Thai, Pad See-Ew, Hoy Tod, and other stir-fried or pan-fried Thai street dishes. The pan performs so excellently and is so versatile that I don’t even mind the fact that it’s painfully huge and heavy. Also, the pan comes pre-seasoned, so it’s ready to be used right away. As a safety measure, I went ahead and seasoned it with coconut oil anyway. To my delight, the seasoning has withstood batch after batch of Pad Thai even with the acidic tamarind pulp in the sauce. I love this pan to bits. I know it took me nearly three years to finally blog about Pad Thai, but, you see, I really want you to make it and to make it successfully. 1 The official transliteration of ผัดไทย is phat thai. 2 More on the subject of “true street food” in another post, another time. 3 The official transliteration of หอยทอด is hoi thot. 4 Not all Pad Thai vendors sell Hoy Tod, though, and certainly not all of them use a flat pan. However, based on my observation, Pad Thai made by vendors that limit their repertoire to only Pad Thai or Pad Thai and Hoy Tod is almost always anything from good to excellent. One easy way to spot a mediocre Pad Thai vendor is when Pad Thai is one of the many dishes on offer at the same stall. Excellent Pad Thai makers almost always sell nothing but Pad Thai and sometimes Pad Thai and Hoy Tod. This is true to my experience, although I’m sure some exceptions do exist. Without input from the locals, it’s very possible that one could travel across the oceans to Thailand in search of a good plate of Pad Thai just to end up at a really atrocious street food stall and with some really sad Pad Thai. Every pad thai recipe I’ve ever tried, no matter how uncompromisingly authentic it seems, has disappointed me because of the overcrowded pan problem. That giant cast iron pan is a brilliant idea. I’m looking forward to the rest of the series! i am very much looking fwd to this series. i’ve only attempted pad thai once and it was to so-so results. i credit your tamarind pulp explanation to saving the dish! The pan looks like it could some serious noodle dish and some other stir fries. I am a home cook and all the while have not attempted to make Pad Thai, knowing that in order to make it right it will require some proper planning and also if I didn’t make it right I will not want to make it at home again. I look forward to reading your Pad Thai writeup. Thanks. Yum-o. I’m liking on facebook and tweeting this now. Are you familiar with the pan named LAGAN used in North Indian cookery. The best shape & quality can be recommended by an expert such as Ashfaque Qureshi: +91-9811160380. See the shape prominently displayed in part 3 here. The slightly higher sides and the tiny, shallow well at the center of this glorified hub-cap allow for an exceptional multipurpose cooking utensil proven over the ages: stir-fries, pilafs, curries, and noodle dishes like these. gautam – Your link didn’t work. Regardless, if the pan is like what is shown here, I doubt it works the same. The sides are so high it looks almost like a shallow pot than a pan, and the material doesn’t seem suitable for Chinese-style stir-fries. I could be wrong. What do others think? I agree that cast iron is the best material for stir-frying, whether noodles or anything else. Actually, aside from one non-stick frying pan to make scrambled eggs, I only use cast iron or enamel coated cast iron. Anyhow, as for stir-frying, I never understood the attraction of carbon steel. The material is thin and does not retain heat as well as cast iron. My girlfriend gave me a cast-iron wok a few years ago and I won’t use anything else. It’s the one possession I want to take to the next life. Yowza, $100? That thing is a beast! Is the flat carbon-steel pan something seen only in Thailand? Jennifer – Yep. 17 inches from rim to rim and 14 inches across the bottom. This cast iron pan *is* a beast. Regarding flat carbon-steel pans, they’re certainly not used in Thailand only. I’ve seen them used in other places in Asia. Other than having the thing shipped (and weighing a zillion pounds) where can you find one? Peggy – I’ve never seen this at any store. But you *might* be able to find one where Lodge products are sold in your area. It’s probably best to buy from Amazon and take advantage of their free shipping option. Oooh, that pan looks stellar! I love cast iron, it’s the best for everything! I even haul a medium-sized pan along on bike tours for easy cooking (folks think I’m nuts, but I eat well enough I don’t mind!)! I have two Lodge cast iron pans and lugged both to the Philippines with me. That’s how much I love them. 😎 I am so looking forward to reading your Pad Thai series and learning how to appreciate what this dish truly is. oooh! Liked on fb, tweeted here, http://twitter.com/dupreeblue/status/76472502213296129 & now I want pad thai. Crap. Everything good is done delivering & I’m realistically still full from dinner. Oh well. Maybe tomorrow. Side note: did you know that Spoon Thai did a Pad Udon? It’s kind of amazing. I am so excited for the Pad Thai recipe! I use your Pad See Ew recipe all the time, it always tastes just like they make it at restaurants. SO good. I liked you on fb and tweeted about this post @emkosmas Can’t wait to see it! 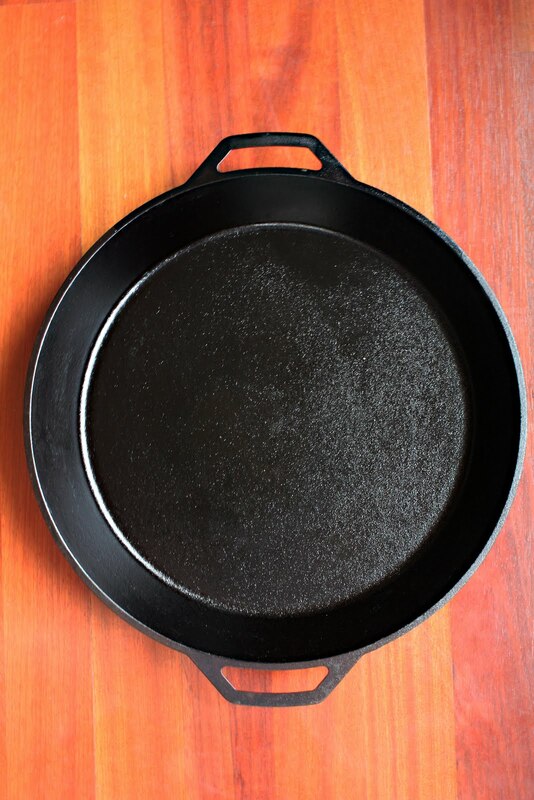 Announcing the winner of this 17-inch pre-seasoned cast iron pan! I have asked Mr. Jack Ruenprapan (@JackPrinya on Twitter to pick a random number. His choice #42 has made @LegallyErin the winner of this pan. Congratulations! Thank you, everyone, for playing. Hey there! I’m @LegallyErin, and I want to thank Leela, Lodge and lucky @JackPrinya! Can’t wait to follow Leela’s Pad Thai series and use the gorgeous Lodge pan to do it. I’ll certainly provide photos and updates! Thanks, Leela! You’re fantastic! My pan came today. Can’t wait to try it out. Excellent start to the series. Looking forward to the rest. Cinnamon and Truffle really need to get ourselves over to Thailand! Greetings fromm Spain, Leela, I love your blog! One question: can you explain how to season this kind of pans? I have one from a french manufacturer, Le Creuset, but I think it’s quite similar to yours. Is it suitable for fried rice? Thanks in advance! 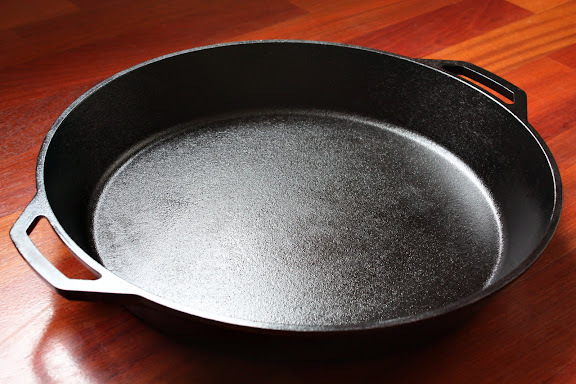 About the pan, not having a Le Creuset cast iron pan, I don’t know if it’s raw or enameled cast iron. Maybe this dialogue between Le Creuset owners would be helpful. My go-to pan is a commercial quality stainless steel [WINCO brand] 16 inch saute pan, < $60 at restaurant supply stores. (A 14 inch Brown Hallco should be around $40 or less) The 16-inch is large enough for 2-3 portions, at least. On a 15-20K home gas burner, it performs superbly for a 1-2 portion pan. Same story with Chinese food. Advantages: 1. nice, SHORT, stay-cool handles. 2. intermediate in weight between cast iron & aluminum cookware. 3. price. 4. cleans easily and well without rusting or losing seasoning. 5. Very multi-purpose utensil in my kitchen, with separate large lid I already have. 6. fewer worries of ingesting too much of the cookware metal owing to acids used in the recipes. My primary reason for abandoning cast iron & aluminum. YMMV!!! So, is it a mistake to make Pad Thai in a wok? I’ve traditionally always made it in my (non-stick electric) Breville wok, with good results, but I’ve never tried to make it in the pan you’re recommending, so I guess I may not know what I’m missing?